Learn about ongoing zooplankton research in Delaware Bay. Explore zooplankton in detail with a magnifying glass. Identify zooplankton that you collect. Find an activity to help bring plankton into your classroom. Zooplankton are aquatic animals ranging in size from copepods which are smaller than a grain of rice, to large jellyfish. They are the ocean’s drifters – moving with ocean currents because of their limited swimming capabilities. The zooplankton community in Delaware Bay contains larval forms of commercially important species, including oysters, blue crabs, and various fin fishes. These organisms spend their early life in the water column before growing into their adult form. Zooplankton are trophic intermediates in estuarine and marine food webs. As such, they provide an important and potentially vulnerable link between phytoplankton and juvenile/adult stages of economically important fish species. 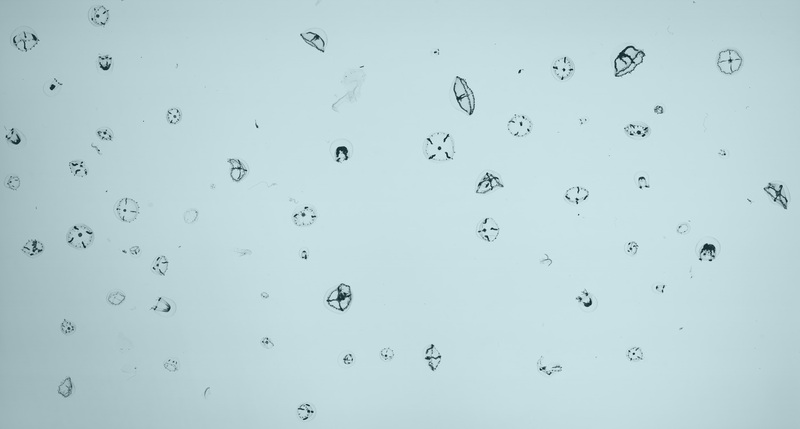 This website provides a glimpse into the fascinating world of zooplankton. Exploring these pages will provide information on their ecology, diversity, and current research in the mid-Atlantic region. Also included are resources for students and educators to aid in your collection and identification of local zooplankton (Who am I? ), explore images of zooplankton with a magnifying glass (Magnify It! ), and lesson plans for using these tools to learn biology concepts.